There are diners not listed on Yelp. Barbecue joints never included in big "best of" lists. Mom-and-pop joints so far under the radar, they've never even been visited by anthropomorphized bowling shirt Guy Fieri. 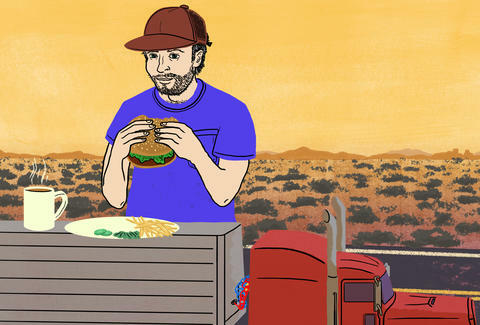 These are the roadside eateries you find by experience, only known by the high priests of the highway, the kings of cross-country traveling, the dudes who sometimes honk when you do that universal honking gesture thing: truckers. They find their spots the old-school way -- by word of mouth, no screens at all -- just as humans did for decades before the dawn of the internet. We enlisted a trio of professional tractor-trailer drivers to dip into their uniquely specialized knowledge of Americana, and deliver (get it?!) a convoy (get it?!) of hidden gems. "This one is just off I-70, east of St. Louis, and it's a good one, there's always at least four or five trucks eating here," said Jerry Whittenburg, of El Paso, Arkansas. He's been driving a truck across America's heartland since 1973 for the Arkansas Trucking Association, has racked up more than 4 million miles, and speaks with a stretched-out Southern twang that's quite nice, actually. "They have great hamburger steak, chicken breasts, fried vegetables, all that stuff. But the real draw here is the foot-high meringue they have on their pies. It really is a foot high, too," he said. "I ordered one once, and it was more than I could eat." "We have this truck stop with a really fine diner in it, it's what I would call classic country cooking," said "Dale" (Dale didn't want his full name or location published because "he didn't want the trouble" -- which is pretty much the most trucker thing ever, so it's cool). Dale has been driving trucks up and down the East Coast for almost 50 years, and recently retired. "It's a real rural Pennsylvania-style kitchen -- with some of the best eggs and bacon I've ever had, and I've had a lot of bacon and eggs. They have thick-cut French fries that I love, they'll throw those on there if you ask them. The only problem is this place gets packed on the weekends. Weekdays, you should be OK."
Classic trucker. Less crowds. More French fries. "New Jersey is known for its diners, right? Well, this one in particular is pretty well known, I think," said Dale. "For trucks, the parking lot won't work, so I've enjoyed this place mostly on my own, and not while I'm on an actual run. "For me, this is what diner-food should be. There's no frills or anything. It's the perfect little diner, it really looks the part. Pancakes, sandwiches, whatever. And obviously, like any Jersey spot worth its salt -- they have some great pork roll. This is a spot that always sticks in my mind. You always know what you are going to get, there's something special in that." "A little mom-and-pop shop -- it's hooked to a place for truckers to shower and clean up, but it's a great restaurant on the side that just makes some excellent hamburger steaks, fried chicken with mashed potatoes, white beans, and patty melts," said Whittenburg. "The last time I was in there, I got ham, eggs, hash browns, and a cup of coffee for $8.50. It's cheap, cheap, cheap, which I can certainly appreciate, having to eat out so much on the road." "It has room for about 20 trucks to park out there, so that's good, but oh boy, this is just a little shack. A little hole in the wall," Whittenburg said. "Their barbecue is just stupendous -- they have BBQ sandwiches, ribs, but what I like is the rib-eye. It's so tender, you really don't even need a knife, you can cut up and eat it just with a fork. I love this place, it's the kind of place you only find just by being on the road for so long." "This one's off I-44, I know the guy that built it 15 or 20 years ago. You can get almost anything you want here, so it's a good name. Pizza, hamburgers, breakfast. Whatever," said Whittenburg . "It's open early, about 6am, and stays open till 9pm. When I'm on the road, I try to eat at places like this, and not just Subway or other fast food. I try to watch my weight, that's a big problem out here when you are driving all day long. So it's good to mix it up and make sure you are getting something close to home cooking whenever you can." "Right across the border from Arizona, this one is just barely in California," Whittenburg said, "but here you've got a little bit of Mexican food, and a little bit of the Midwest, too. You can order what you want, good variety. "It's also a really nice place just to sit down and relax. They always have the ballgame on, or NASCAR. I haven't been there in about three years, but I have a friend that goes there a lot, and he told me it's still a good place. And I trust him. You all should, too." "You've got two elderly ladies in the kitchen here at this place," Whittenburg said, "Good country cooking, good old-timey cooking, too, right off exit 63. "Great hamburger steak, good chicken-fried streak. Oh! They have really great biscuits and gravy, too. I know this isn't what you would really call health food, but I think eating like this is healthy, too, you know? Nice home cooking by nice people." "I have a really good one, right off old Route 66," said Otto Schmeckenbecher, a trucker with 30-plus years of experience, living in the Little Rock, Arkansas area. "They have great salads, burgers, steaks, catfish, ribs, and all the fixings to go with it. You can finish it off with homemade cobbler. "The people are always friendly and glad to have you there. I've eaten there several times, never had a bad meal. The decor fits the steakhouse, and on Saturday nights they have live music. Just a real good place to stop and eat and enjoy yourself. Truck parking available, too." "I like to go out and support local business when I'm driving. This is one I found on the recommendation of a friend. It's a tiny little convenience store that's really in the middle of nowhere, but they have a grill in the back and cook up some good food, if you want it," said Dale. "I know they make hot cinnamon buns, burgers, hot sandwiches; the people there are a little gruff, but nice overall. This is the kind of local business I try to go to, whether I'm working or not. They are almost always better than chains or fast food. If you can find the right places, of course." "Well, I have to say, this is some of the finest Mexican food I've experienced out on the road," said Whittenburg. "It's a pretty popular place. They have it all: beef tacos, cheese dip, salsa, fajitas. But the big thing is that it's all seasoned so well, especially if you like hot stuff. "Out in the Southwest, on runs to California, I always try to get my fill of great Mexican food. I don't think this is news, but out west the Mexican food is just a little bit better, always. And this is some of the best, in my opinion." "OK -- this was a legendary stop off of I-95 in Brunswick, Georgia for many, many years. It closed down about four or five years ago, but since then the original owners have opened up a new spot in Ft. Lauderdale," Dale said. "I've had barbecue all over the South, all over the country. It doesn't get more real than these guys. I'm partial to the pork, this being the Georgia Pig, after all. But, there's something for everyone. Unless you are a vegetarian. Then you're better off staying away. Even though their coleslaw is pretty good, too." Wil Fulton is a staff writer for Thrillist. Shockingly, he's actually been to two of these places. Ask him which ones, @wilfulton.